Be the first to share your favorite memory, photo or story of Rev. Javier . This memorial page is dedicated for family, friends and future generations to celebrate the life of their loved one. Rev. Javier Losarcos, 90, passed away peacefully, on Thursday, November 8, 2018 at St. Catherine of Siena LTC in Caldwell, NJ. Father Javier was born in Olite, Navarra Spain and immigrated to the United States at the age of 19. He was ordained a priest on Jun 3, 1951 in Kansas City, Kansas. He had several Parochial Vicar positions within the Archdiocese of Newark since 1963. Father was Incardianated in May 1980. 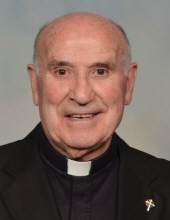 He was Parochial Vicar at St. Columba, Newark; Our Lady of Good Counsel, Newark ; St. Cecilia's Church, Kearny, St. Francis Church, Richfield Park; St. Peter’s Church, Belleville; Pastor of St. Aloysius Church, Newark and St. Benedict’s Church, Newark. During his retirement, Rev. Javier celebrated the Spanish Mass at Our Lady of Mt. Carmel Church, Newark. For many years Rev. Javier was very active with the Cursillo Movement. Father Javier retired in July of 2004. Rev. Javier is the son of the late Juan Losarcos and Ana Lenzano; survived by his sister Ana Maria Losarcos and brother Eduardo Losarcos of Spain; and by his second family, Nilda Ortiz and her husband Genaro, and their children Genaro Ortiz Jr., and his family Genaro Ortiz III, Cyrus Ortiz and Lita Ortiz, Carlos Javier Ortiz, Marcos Antonio Ortiz and Maria Pilar Ortiz. The Funeral for Rev. Javier will be on Tuesday, November 13, 2018 at 10:00am at Our Lady of Good Counsel, 654 Summer Avenue, Newark, NJ 07104. Interment to follow at Holy Cross Cemetery, North Arlington, NJ. Relatives and friends are welcome to attend. The visitation for Rev. Javier will be on Monday, November 12th from 4-9 pm at Our Lady of Good Counsel Church, Newark, NJ. To send flowers or a remembrance gift to the family of Rev. Javier Losarcos, please visit our Tribute Store. "Email Address" would like to share the life celebration of Rev. Javier Losarcos. Click on the "link" to go to share a favorite memory or leave a condolence message for the family.